If you’ve got even a passing interest in cookery, you can’t have failed to notice the popularity of air fryers. Today, we’ve focused on large capacity air fryers so you’ve got space enough to cater for all the family. Start cooking with much less oil and enjoy a healthier diet without any of that oxidized oil from deep frying. We’ll also walk you through exactly how these appliances manage to deliver such crispy yet tender food without any of the attendant health risks of deep frying so you know exactly what you’re getting yourself into. To kick things off, then, we’ll give you a look at 10 of the very best large capacity air fryers on the market so you can see which makes the best fit for your kitchen. II. How Does an Air Fryer Work? At the smaller end of our collection of large capacity air fryer reviews is arguably the best of the bench. 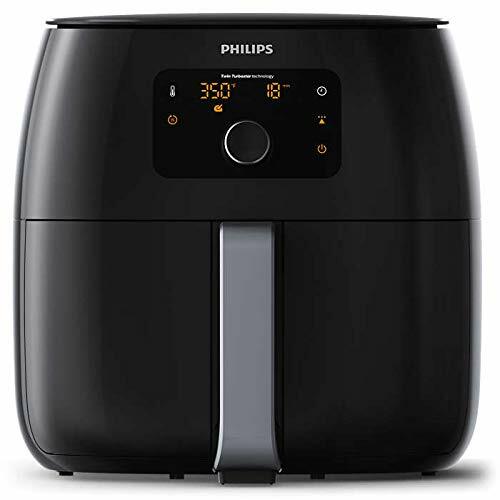 Philips has dominated this emerging space completely and this digital air fryer gets our overall vote. It’s not cheap but the best things in life rarely are. While some air fryers tend to leave food undercooked in places and scorched in others, the Philips brings pioneering Starfish technology to the fore and you’ll get everything done to a turn. From grilling and roasting through to baking, don’t fall for the marketing hype since air fryers don’t actually fry at all. This is a good thing, though. You’ll end up with a scaled-down convection oven capable of delivering a wide array of mouth-watering food without any of the attendant risks of oxidized oil damaging your health. If you’re looking for a highly dependable air fryer at a very reasonable price-point, this 3.7-quart Avalon Bay model is a smart choice. You’ll get a unit rated at 1400 watts and capable of heating your food right up to 400 degrees Fahrenheit but you won’t get any of the health risks associated with deep frying at this temperature. The basket has non-slip feet so transferring your food is super-safe and the plastic is all BPA-free so you won’t replace one health concern with another. All removable parts are dishwasher-friendly rendering clean-up a cinch. 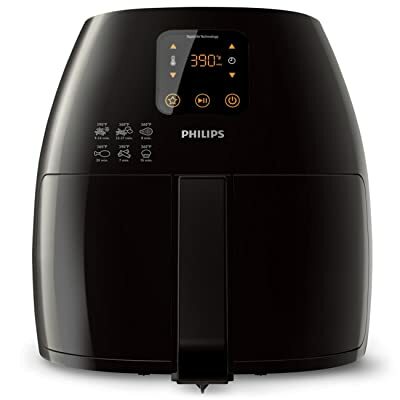 If you want your food nicely crisped up on the outside but perfectly tender on the inside, this air fryer operates on the same principle as a convection oven but with arguably superior results. And, if you’re still in any doubt, why not just order one up since you’ll have a full 3 months in which to return it if you’re not completely satisfied. What more can you ask for, really? Using 75% less oil than conventional methods of frying, this dishwasher-safe air fryer is a pleasure to use and super-simple to clean up, pretty much the opposite of the deep-frying experience. If you’re not sure about what to cook in an air fryer, you’ll get a couple of bumper recipe books so you can get straight down to business. Perhaps you’ve got a larger family and you’re not convinced this 3.7-quart fryer will be fit for purpose. 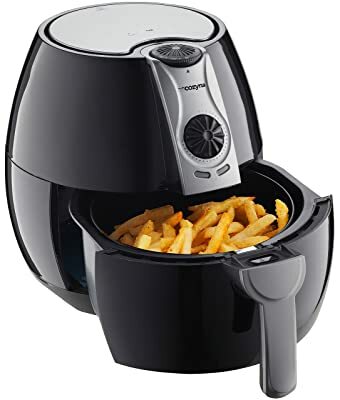 Don’t worry, they also do an even larger capacity air fryer good for families of 5 or more which we’ll review shortly so you make sure nobody stays hungry! It’s time to ramp up the size with this large capacity air fryer from the Philips Avance Collection. Looking lean and mean, it takes up a fair amount of countertop real estate so this is not much use for anyone living in smaller apartments or anyone operating on a budget. If you’ve got a big kitchen, a large family and deep pockets, though, air fryers don’t come much better than the TurboStar. You’ll be able to rustle up substantial meals using far less oil than regular frying calls for an the Philips app gives you plenty of help if you’re fumbling for recipe ideas, a common problem when you’re starting out with an air fryer. If you want the rack and grill pan, you’ll need to buy these separately, something of a disappointment considering the ruthless price tag. The potent heater and motor combine to give you all the firepower you need for ambitious cooking duty without any worry about burning the unit out. If you have the cash to spare and you’re looking for the best large capacity air fryer on the market, we can’t recommend this 4-quart model strongly enough so what are you waiting for? At the halfway mark of our large capacity air fryer reviews, we’ve got a mid-priced model from Secura with a generous 4.2-quart capacity giving you ample room inside to cook for a larger family. The 60-minute timer combined with auto shut-off gives you the confidence to leave your air fryer going while you watch TV without worrying about an accident in the kitchen. If you’re not too familiar with quarts, the sizing equates to roughly 4 liters with this model so there’s ample scope to cook larger meals for 4 or 5 people without needing to make multiple batches. The BBQ skewers and rack thrown in are a nice touch considering the keen pricing. You’ll also get a handy little recipe book for some added inspiration. 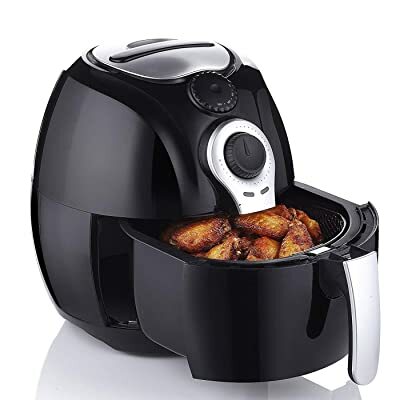 Stepping thing up further in terms of capacity, this 5.4-quart air fryer from Power Air Fryer XL is man enough for even very large families who want to eat more healthily while still enjoying the classic taste of fried food. The trade-off for this large capacity is an air fryer that doesn’t exactly fade into the background so make sure you have plenty of space in the kitchen before committing to purchase. The digital interface makes operation a breeze and you’ll get plenty of presets covering all main bases from baking through grilling and just about everything in between. The brainchild of Eric Theiss, a former chef and restaurant owner, means you’re getting impeccable design from someone who’s spent plenty of time in the trenches so you know you’re in safe hands with this impressive large capacity air fryer. 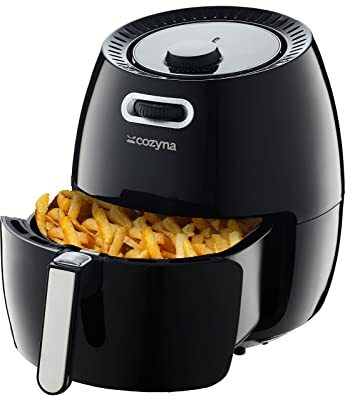 The principle underpinning air fryers is simple and the results impressive so if you want a change from that gut-busting deep-frying that does your heart as few favors as it does your waistline, put your faith in Cozyna and enjoy the same food with much less oil yet no real dip on the taste front. As with all extra-large capacity air fryers, you’ll obviously need to accept the appliance is not exactly compact. As long as you’ve got space in the kitchen, though – and if you have a larger family then you probably do – you won’t regret this purchase for a moment. And if you’re not completely satisfied, Cozyna offer a no-quibbles money-back guarantee for the first 60 days so what have you got to lose? Before we round out with a pair of multi-purpose air fryers, we’ve got another 5.8-quart model for you, this time from GoWISE. With pans, inserts, skewers and a great recipe book thrown in, you’ll be amazed at the value for money you get but you won’t get stiffed on the performance front. Far from it! You’ll get the best of both worlds with manual controls or presets depending on which works best for you. If you’re not too confident with recipes, you’ll get fully 50 to choose from in the included book. The alarm is a great touch and helps you to remember to periodically shake the basket to encourage completely even cooking throughout. If the bulkier 5.8-quart model is a little too large for your needs, you could scale things down with the smaller 3.7-quart alternative available at even more pocket-friendly price without any reduction in functionality. The first of a couple of combination, multi-purpose units is up next as we tail off our large capacity air fryer reviews. 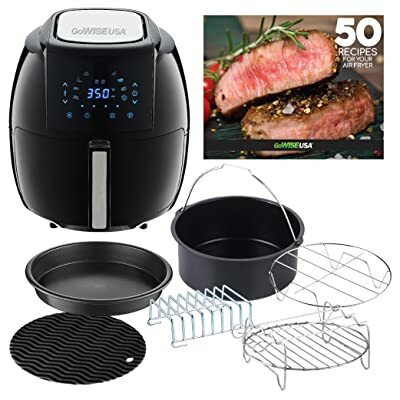 If you’re not sure you want to commit to a dedicated air fryer, this supersized model from Cuisinart will also allow you to bake and broil while enjoying the full benefits of both an air fryer and a convection oven. You’ll also be able to warm food through and even make yourself some toast. If you have a busy and overcrowded kitchen, this is a nifty all-in-one solution from a brand you can rely on. To give you an indication of the quantity you can prepare, you’ll comfortably roast a 4-pound chicken or prepare a large pizza and if you’re toasting, you’ll have space for 6 slices. If you have a larger family, this hard-hitting multipurpose unit is a great way to save time and space and it’s available at an incredibly low price, too. Finished in silver, it looks as good as it performs so if you fancy all the benefits of an air fryer with even more leeway, we’d urge you to road test the Cuisinart at your earliest convenience. Last up in our look at large capacity air fryers is another multipurpose piece of kit from Breville, a heavyweight in the kitchen appliance industry for decades. Aside from a price tag that will make you wince and a bulky footprint, there’s nothing but praise heaped on this smart oven from its legion of satisfied customers. Of all the air fryers we tested, this one impressed us most in terms of sheer versatility along with top-notch performance. Despite such wide-ranging functionality – you’ll get a full 13 different cooking options including, of course, air frying – the Breville is a cinch to use. The crisp LCD display is easy to read at a glance and you can flit between the settings at the push of a button. 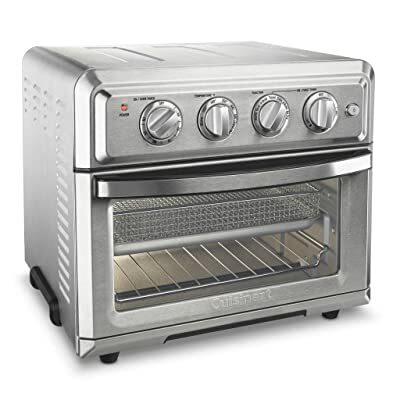 Capacity is an outright winner with 1 cubic feet of space inside giving you the ability to toast up 9 slices of bread or roast a 14-pound chicken without worrying about overcrowding or uneven cooking. 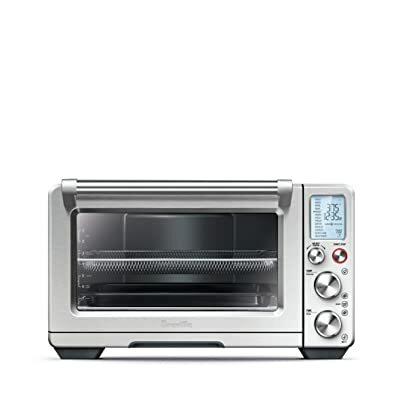 If you want an all-in-one appliance that air fries to perfection while offering much, much more, we can’t recommend the Breville Smart Oven highly enough. Check one out today and start cooking with much less oil tomorrow! With our large capacity air fryer reviews put to bed, it’s time for a quick look at the mechanics behind these nifty appliances. We’ll also glimpse at some of the most frequently asked questions so you can buy with total confidence and start cooking more healthily with far less cleaning up to do into the bargain! Deep fried food might be extremely tasty but it’s obviously not a healthy option. Luckily, air fryers have now become commonplace but what are they and how do they work? An air fryer is a small countertop appliance very much like a convection oven. You can cook the full spectrum of foods you’d normally expect to fry by traditional methods but without the attendant damage caused by deep frying in oil. Air fryer is actually a somewhat misleading marketing buzzword. These appliances bakes food rather than actually frying it. The controls and settings sit at the top of an air fryer along with a fan and heating element. Down below, there’s a basket you slip out so you can place your food inside. When you heat food in hot oil, the heat causes the oil to oxidize. This not only strips the majority of nutrients from your food, it’s also a contributory factor toward heart disease. With an air fryer, the food is heated from every direction with hot air blown around the interior of the appliance. While the air in a convection oven moves pretty slowly, it circulates much more briskly in an air fryer and the confined, compact nature of the appliance helps encourage quick and even cooking with no damaging oils ruining your food and your health. That crispy golden brown is achieved through something called the Maillard effect. The standard method of submerging foods completely in oil at high temperatures achieves this very effectively. With an air fryer, the same effect is neatly achieved by coating your food in a very thin layer of oil while the air around it is heated up to 392 degrees Fahrenheit, enough to trigger the Maillard effect while using fully 75% less oil than you’d need when deep frying. This allows you to eat much more healthily while still enjoying fries, steak and pastries with that trademark golden brown texture. Your food sits in a cooking basket over a drip tray. You use the temperature and timer settings to tailor things to your precise requirements. By occasionally given the basket a good shake, you’ll promote even oil coverage and consistent cooking. Depending on the model you choose, you’ll either get an integrated agitator to help with this or you might need to take action manually. Either way, air frying is a very easy method of cooking and nowhere as labor intensive as slaving over a pan of hot oil. Now you’ve got a solid overview of the mechanics behind this increasingly popular and super-healthy alternative to deep frying, we’ve got the answers to a few of the most frequently asked questions about air fryers. Due to the method of cooking, you’re better off avoiding any super-light food that will end up being blown around inside. For the same reason, any wet batter is best sidestepped as well unless you want an incredible mess to clear up. Fine ingredients in general don’t respond well to air frying either. This means no salt and pepper, no leafy salads. If you really want to season your food, try seasoning the oil instead. What size air fryer is best for a family of 2 members? We graded the air fryers we reviewed in ascending order of size to make it easier for you to compare them. If you’re cooking for 2 people, 2.2 quart to 3 quart models are more than adequate. Our focus today has been on large capacity air fryers, though, so we haven’t catered for any of those in our reviews. If you need something smaller, just use those sizings as a guideline. What size air fryer is best for a family of 5 members? Cooking for 5 people, you really want to ramp things up to an air fryer with a capacity of 5 quarts or above. The smaller models we reviewed today are ideal for 3 or 4 people while the latter models on the list work well for larger families of 5 and above. Are Teflon air fryers safe? Teflon made after 2013 is perfectly safe so given the recent appearance of air fryers on the market, you’ve got no concerns about the non-stick surface giving you Teflon flu or other more serious health issues. The only problem you’re likely to experience is that the coating will degrade over time when exposed to extreme heat. This is entirely a personal decision. Only you can tell how much emphasis you place on a healthy diet and we’re not here to tell you how to cook or how to live. 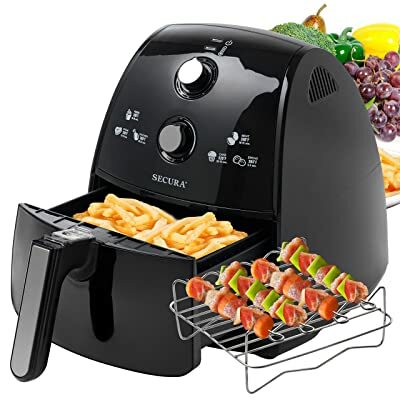 There’s no element of doubt that cooking with an air fryer is a dramatically healthier option than deep frying – more on that below – so if you want to reduce the amount of fat and oil you take on board, investing in an air fryer makes perfect sense. Another area that’s largely personal concerns finance. If you’re operating on a tight budget, it’s probably not a smart move to buy an air fryer. They’re not cheap and you might not end up getting much use out of it. If, on the other hand, money is no object, we’d strongly suggest giving an air fryer a chance. In a word, no. Well, not if you want to replicate deep fried food. Filling the air fryer to capacity will result in soggy and uneven food so this is the first thing to avoid. The other common mistake is to expect the same results you’d get from deep frying when you’re baking the food rather than frying it. The best approach is to accept that battered food and fries are probably going to taste better cooked the regular way and to limit your consumption of those. With an air fryer, get more creative and harness its strengths to expand your cooking repertoire and eat more healthily alongside the occasional deep-fried treats. 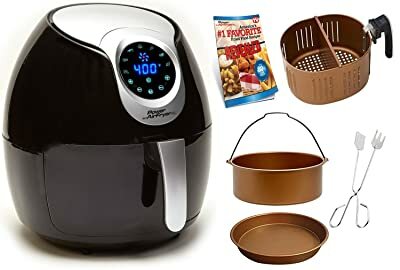 How do you clean the air fryer basket and pan? Cleaning the basket and pan is extremely simple. All the removable components of an air fryer are dishwasher safe so you can always pop them straight in if that you’re preferred method. If not, just give them a good scrub with some soapy hot water and you’re good to go. Keep on top of doing this regularly and you’ll never face too much of a clean-up job. How do you clean the inside and outside of an air fryer? Make sure the air fryer is unplugged and you’ve given it time to cool down. For the outside, just give it a quick wipe down with a damp cloth. Use the same principle for the inside and you’ll keep your air fryer running optimally extending its lifespan and improving the quality of your food. How often should you shake the basket when you’re cooking? The more the food is overlapped, the more frequently you should shake the basket. Doing so regularly while you’re cooking will have no negative consequences and will make sure everything is perfectly and evenly cooked. Do you need to preheat your air fryer? This really depends according to the manufacturer and model. Some do recommend preheating while others are ready to roll straight from the get-go. Check the instructions and follow the specifics closely. Our own advice is that preheating works best and it won’t do any harm but exercise your own judgment and do what seems right for you. By now you should have a solid overview of why air fryers are such a healthy and efficient alternative to deep frying. If you set the name aside and consider the fact you’ll be baking your food rather than frying it, this should help you determine what recipes will work best in your new appliance. You should also have a clear idea of which of these large capacity air fryers deserve a place on your shortlist. Everyone has varying needs in terms of family size and cooking preferences so we’ve tried to include something to suit as wide a range of requirements as possible. We’ve also attempted to cover a representative selection of price ranges so you can enjoy cooking more healthily whether you’re on a restricted budget or the sky’s the limit. 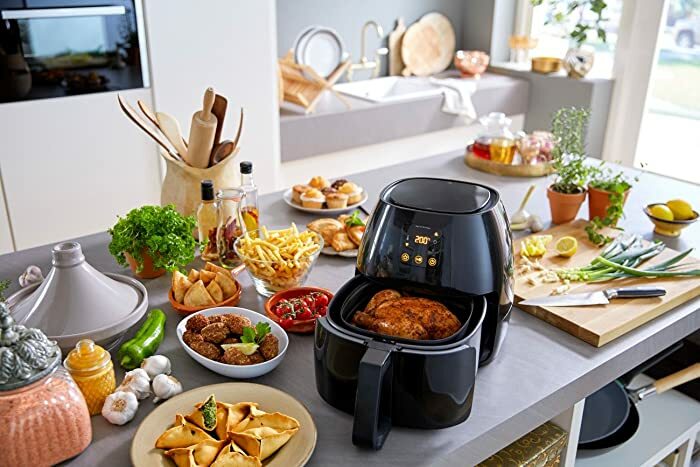 If you’re still not sure what to cook in the air fryer, opt for one of the models boasting a free recipe book or invest in a book yourself if you don’t like the idea of spending hours online tracking down the best air fryer recipes. And always feel free to drop us a line. We rigorously tested so many of these machines, we’re more than happy to share this knowledge with you one-to-one. So get in touch any time and come back soon! We’ve got some rice cookers we’re just finishing up testing so we’ll have our report with you imminently!